What is a Stove Fan - UK Stove Fans Guide to a Woodburning Stove Fan. What is a Stove Fan? What is a Stove Fan; Have you got a gas or wood burning stove? Ever found yourself sitting as close to it as you can just to get warm? Our heat powered stove fans are the perfect solution to this problem. Scroll down to find out more about our fans and how they can benefit your home! 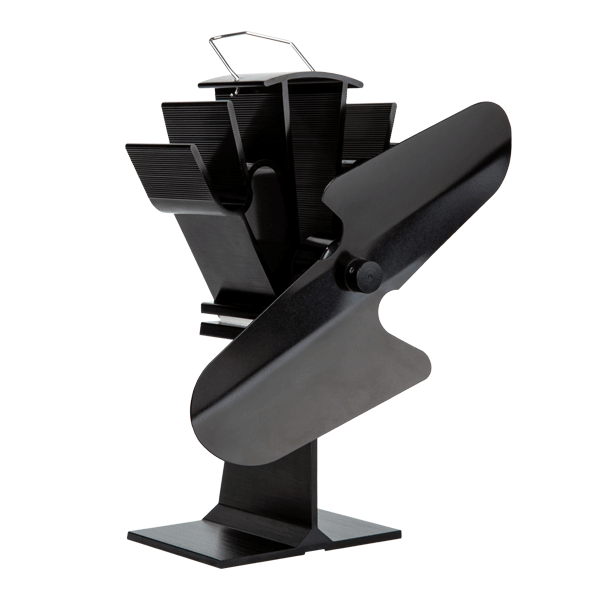 A stove fan is designed to equally distribute warm air across the room created by a gas or wood burning stove. It has a Peltier module that acts as a generator to power the stove fan’s discreet motor. Our stove fans only use heat from the stove so is completely self-powered. By using a stove fan this will result in lower fuel costs and reduced emissions. The stove fan will begin to operate when the surface temperature reaches 50°C. Because of the low starting temperature, our stove fans can be used on gas stoves as well as wood burning stoves. Using a stove fan is the most economical way to effectively circulate warm air. It uses no batteries so can be used where there is no electricity. Do you ever find that if you don't sit relatively close to your stove you don't fully benefit from its warmth? Most heat generated from your wood burning stove heads directly towards the ceiling and walls. We have the perfect solution for this! Meet our heat powered stove fans. Having a stove fan will drastically improve warm air circulation, reduce cold spots and increase the efficiency of your stove. 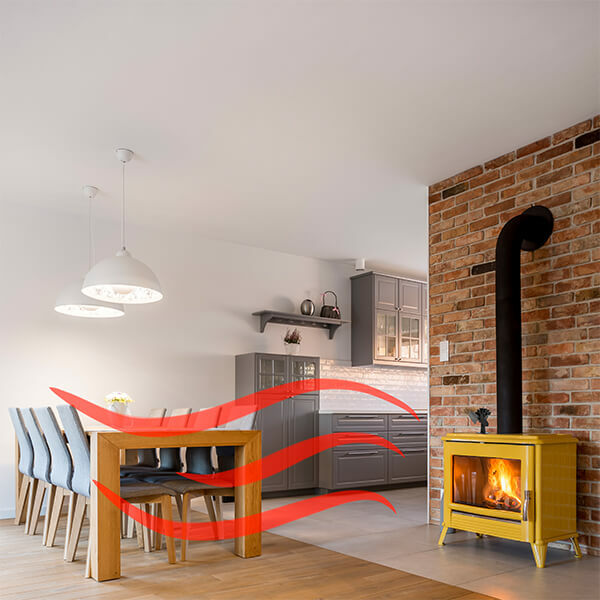 Using a heat powered stove fan is the most economical and effective way of circulating the warm air generated from your wood burning stove across your room. Cosy up your room and compliment your wood burning or gas stove with a heat powered stove fan from our gorgeous range. Start increasing the efficiency of your wood burning stove and start saving today. With our heat powered stove fans, they gently circulate warm air equally throughout the room. By using a UK Stove Fans heat powered stove fan, you can cut costs by up to 30% by burning less fuel! 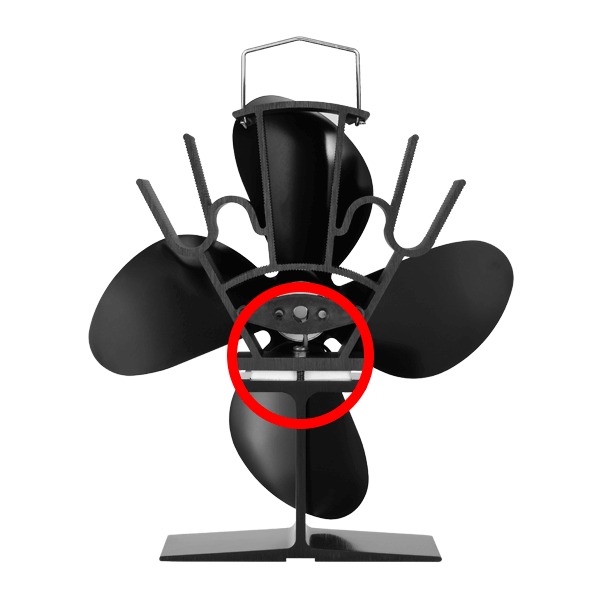 All of our fans have a built-in safety strip which gently elevates the base of the fan when the surface temperature reaches above 250°C. This prevents the risk of your stove fan overheating and damaging the motor. Because of our fans' super low 50°C starting temperature, this makes them ideal for all radiant wood fires and stoves. As long as the surface temperature you're placing your fan on is at least 50°C, the fan will work! Every fan offer comes fuss free; no wires, no maintenance and no electricity. Simply place on top of your stove and you're all set! You're probably now wondering how a heat powered stove fan works right? The motor which turns the blade is powered by a Thermoelectric Cooler (TEC), which operates according to the Peltier Effect. The Peltier Effect is the presence of heating or cooling at an electrical junction of two different conductors. When a current is made to flow through a junction between two conductors, A and B, heat may be generated or removed at the junction. Once the Peltier energy is generated, this then supplies power to the motor causing the blades to rotate. 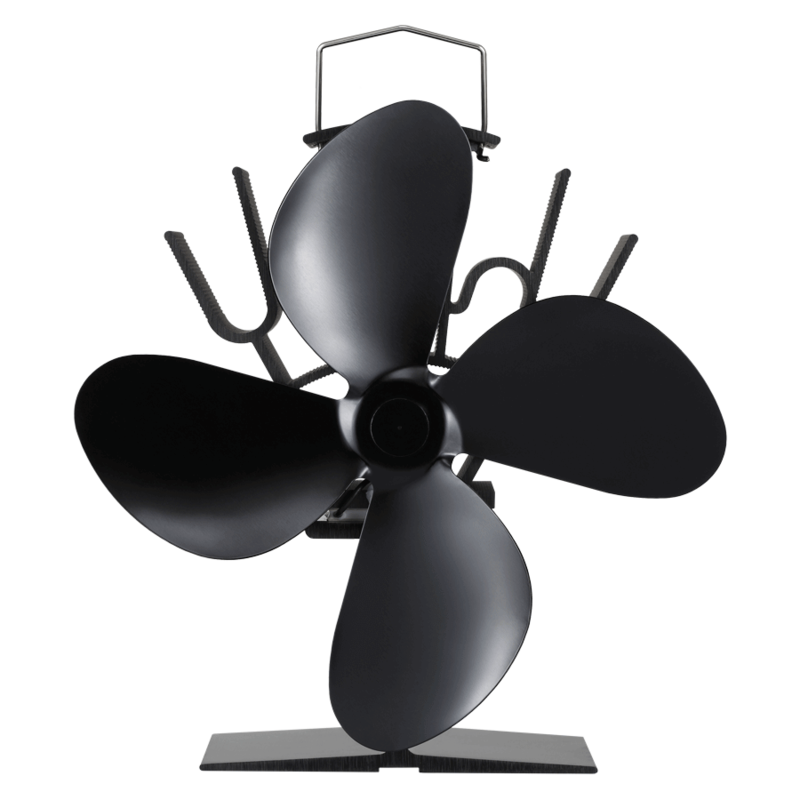 We at UK Stove Fans offer a broad range of fans in all shapes and sizes. Our fans start from 125mm to 230mm in height. 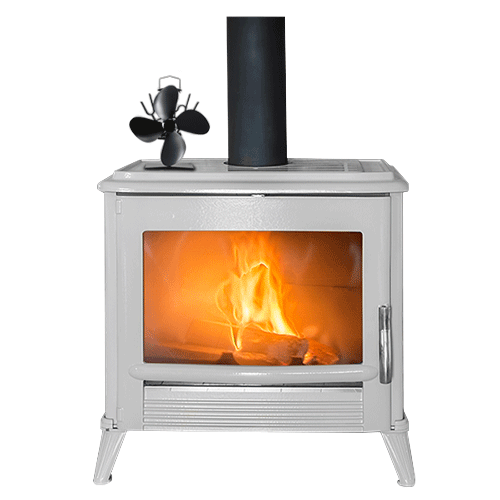 Compliment the look your stove with our most premium 3 blade the 353, however, if that's too tall why not opt for our 4 blade mini the 524? We pride ourselves in the quality of all of our products. 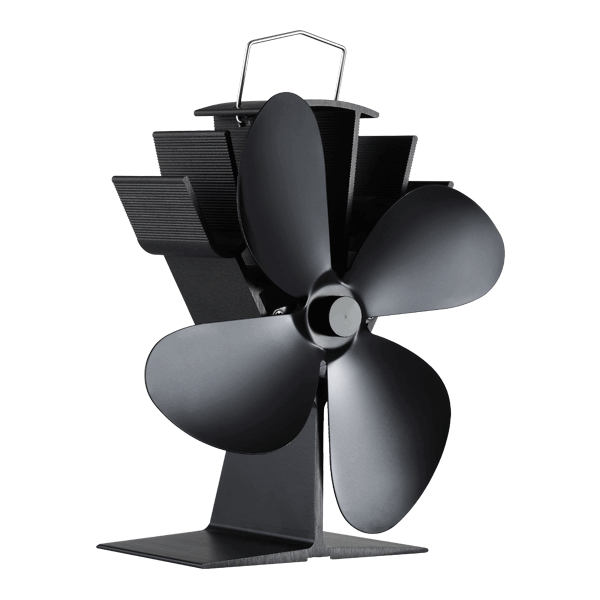 UK Stove Fans fans are constructed from anodised aluminium to improve durability and maintain quality. All of our fans have a super low 50°C starting temperature and temperature varied fan speed. 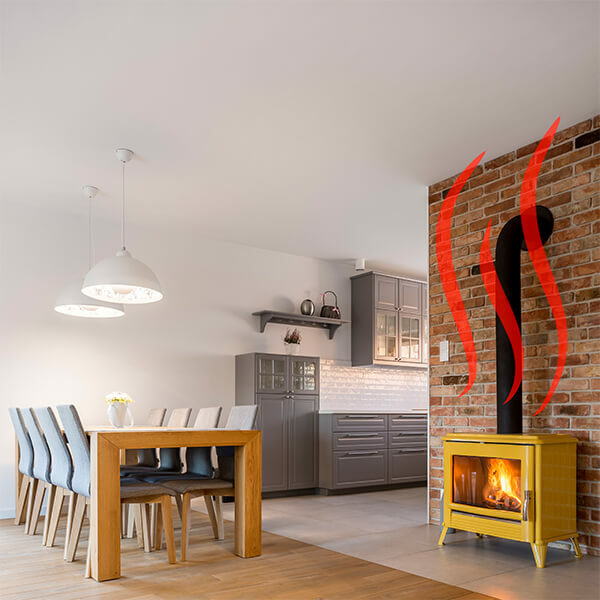 Above all, remember the woodburner stove fan is the must have accessory to compliment the true heat of your stove and especially helpful for those who want to save a little in the pocket and be eco friendly at the same time. Running on zero fuel itself (except that produced by the fireplace), these eco stove fans are the best fireside accessory to have. It also adds a little talking point when guests arrive and see the self generating heat powered stove fan working. Fireside Accessories help create that perfect feel to a stove in the home.